Patients who are considering cosmetic and plastic surgery generally have numerous questions, many of which can be addressed only on an individual basis. Some questions, however, are so frequently asked that we feel it is worthwhile to address them on our website. Below are many of the most common questions that rhinoplasty patients at the office of Dr. C. Spencer Cochran ask us when planning their surgery. What happens during a consultation and how long does it take? Can I have a consultation one day prior to surgery? Do I have to stay overnight at the surgery center? Do I have to bring someone with me? When can I start exercising after the operation? Can I have other procedures performed at the same time as my rhinoplasty? What are the limitations following surgery? When can I fly on a commercial plane? Can I see my hometown doctor for post-op visits? How long will it take for bruising and swelling to subside? Insurance companies will pay only for the portion of rhinoplasty that is performed to improve breathing (functional surgery). They will not cover any portion performed to improve your appearance (cosmetic surgery). The Dallas Rhinoplasty Center does not contract with any insurance plans, Medicare or otherwise; however, if it is determined that you have a functional problem, we will contact your insurance company and attempt to obtain approval of coverage. You must have out-of-network benefits in order to be reimbursed for the surgeon’s fee and anesthesia. The surgery center DOES contract with many plans so your hospital bill may be insurable. Understand that it is our policy to collect 100 percent of the surgery and anesthesia fee four weeks prior to your surgery. After we have sent a letter to your insurance company telling them your problems and outlining our recommendations including the costs, it is your responsibility to follow-up on the amount of the costs they will cover. Even after that, most insurance companies will not give you a specific amount but they are more likely to give information to you than they are to us. It is YOUR responsibility to obtain written authorization from your insurance company. They will not inform us of an exact dollar amount of benefits allowed nor will they guarantee coverage. The length of a rhinoplasty consultation at our office is approximately one and a half hours. The consultation begins with our photographer taking several pictures of you. These will help Dr. Cochran to explain the goals of your surgery. The nurse then briefly discusses your medical history with you to ensure it is complete. Dr. Cochran will review your history, examine you, and discuss the benefits, risks, and potential results of the procedures that interest you. Next, you and the nurse will review guidelines regarding postoperative care before you are escorted to our patient coordinator’s office. The patient coordinator will discuss available surgery dates as well as the fees associated with your procedure. At the conclusion of the visit, she will provide you with a written fee quote and you will be required to pay a consultation fee. Please be aware that we do not contract with any insurance companies, so the consultation fee must be paid in cash or by check or credit card (Visa®, MasterCard®, or American Express®). In most cases, surgery cannot be scheduled for the day after an initial consultation. During the consultation, a proper surgical plan is determined and the pros and cons of surgery are discussed. After this you must take some time to consider whether surgery is right for you before deciding to proceed. Patients evaluated through our virtual rhinoplasty consultation program, however, may be able to schedule surgery for the day following their in-office consultation. An overnight stay is required only if your rhinoplasty requires a rib cartilage graft or you are a high-risk patient. 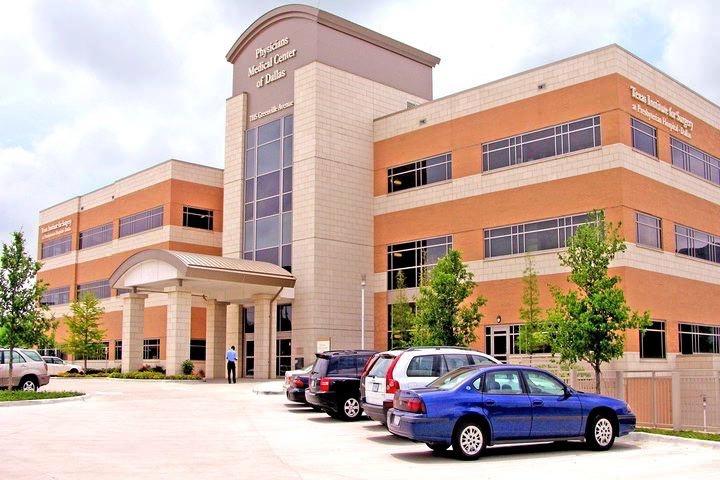 Surgeries are performed at Texas Institute for Surgery, which is located at 7115 Greenville Avenue. It is on the Presbyterian Hospital of Dallas campus and is a part of the Presbyterian system. You are required to have a caregiver upon discharge from the surgery center. If you are a primary rhinoplasty patient, you are required to have a caregiver for 24 hours following surgery. If you are a revision rhinoplasty patient, you will be required to have a caregiver for 48 hours following your discharge from the surgery center. The Dallas Rhinoplasty Center accepts cash, direct wires, verified checks, MasterCard®, Visa®, American Express®, and CareCredit®*. We collect the surgeon and anesthesia fees ONLY. You must pay the facility fee directly to Texas Institute for Surgery. They also accept CareCredit®. *If you are interested in using CareCredit®, you can use the online payment calculator to calculate your monthly payment or find out if you qualify for CareCredit® immediately by applying online. Two weeks after rhinoplasty, you may begin exercising gradually and increase your routine as tolerated. Do not start your regular routine until at least three weeks after surgery. Patients who have had rib grafts should not do exercises that cause pain or discomfort in the chest area. However, other exercises such as walking or jogging may start at 3 weeks. Yes, depending on the length of surgical time required. If Dr. Cochran determines it is safe for you to undergo additional procedures, such as a chin implant or other facial procedures, our practice will gladly coordinate it. Patients can usually return to school or sedentary work one week after surgery, once the cast is removed. Although you may feel like going back, you will have some swelling and bruising which will take another week or so to fade. You should avoid strenuous activity (any activity that increases your heart rate) for two weeks. Work requiring more strenuous physical activity such as lifting or frequent travel may require a longer recuperation time. In addition to avoiding sun exposure, you should protect your nose from contact with other objects and refrain from wearing glasses for eight weeks after rhinoplasty. You may fly 48 hours after surgery. If your doctor would like to participate in your care, our nurse can contact your doctor to make arrangements. Ideally, we would like to remove your cast, sutures, and splints at our office in the Dallas-Fort Worth area, but if you must return home, you are required to contact our nurse and have her coordinate care with your local physician before your operation. Some swelling and bruising of the nose and around the eyes are to be expected. After peaking 48 to 72 hours following surgery, this should start to subside. Some swelling and bruising is usually still present when the cast is removed at one week. Normally, after approximately 10 to 14 days, most of the visible bruising will have disappeared or be easy to conceal. Patients will also experience a feeling of numbness and stiffness in the tip of the nose, which will fade as the swelling subsides. It usually takes about four months for most of the swelling to resolve. While you may initially feel self-conscious about your temporary appearance after rhinoplasty, it is generally not noticeable to others after two to three weeks. In general, one year is required for the nose to assume its final appearance. For patients with thick or oily skin, certain effects may be slower to resolve.